'Let nothing be wasted' feels an apt methodology for the small, intimate group exhibition 'Wasters' at Edel Assanti. Its title refers to the term for discarded remains of ceramic objects damaged during the firing process. Nonetheless useful, these leftovers are usually recycled into aggregate or to regulate the temperature in the kiln in subsequent firings. The works included in 'Wasters' are an outcome of the exhibition 'Rough Music' held at Cass Sculpture Foundation in summer 2015. Alongside the production of a new ceramic piece in the wood-burning kiln at Cass, each invited artist produced a waster for this exhibition. With examples of wasters held in the V&A's permanent collection, there is precedent for their understanding as decorous objects. But in thinking of the waster not as an object but instead as a process, 'Wasters' explores the poetic potential of the recycling of forms. As such, this exhibition proposes the idea of a waster as the spark for the creative act, beyond its traditionally utilitarian function. The generative act paradoxically must originate in waste and cast-off. Curated by Alex Hoda and Robert Rush, the exhibition design is evocative of a working studio. Three reclaimed timber structures intersect the back corner of the gallery in an open triangular configuration that contrasts with the fluid and tactile ceramic forms they support. Directly beneath the pyramid skylight a central plinth brings focus to the display, on which rests a ceramic bowl with an elegant fault within. This piece acts as the clearest metaphor for a waster and calls to mind a potter's wheel in a somewhat didactic moment of staging. However, this gesture facilitates the viewing of the surrounding works within the context of a shared creative process. For the exhibition at Cass Sculpture Foundation each artist responded to the term 'rough music', which refers to an English folk practice common in the 18th and 19th centuries. This theatrical tradition had roots in local communities; when an individual had committed a misdemeanour, they would be bawdily and publically ridiculed by a spontaneous performance outside their home. This cacophony might include crude skits, songs, rhymes and the banging together of household items to attract maximum attention to the ridiculed subject. Rough music amounted to a highly vernacular and public form of satire. The stage-like setting of the exhibition affects such theatricality. The visual language of rough music suffuses several works; pieces by Alex Hoda and Mark Essen in particular reveal traces of domesticity and absurdity in their form. Hoda's bathing figurine, with its contorted limbs and lurid colouration, brings the aesthetics of grotesque into a private space. Essen's series of five sculptures call to mind the poured forms of Lynda Benglis in their plasticine tactility. Each work resembles a bunch of forgotten receipts stuffed together on a central vertical spike. Through repetition of forms and suggestion, Essen situates an everyday act within a moment of banal violence. Violence gives way to a sense of the macabre in Bedwyr Williams' sculptures of black, cartoonish ears that are at once human, at once beastly. Laure Prouvost's strange eyeball-like sculptures nestle behind Williams' works in what starts to feel like a game of spot the body part. 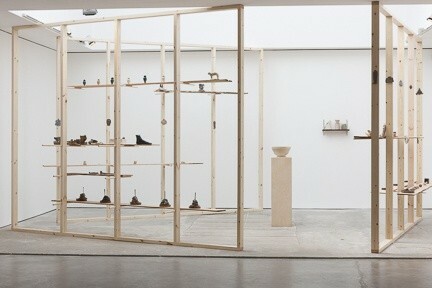 Their works employ a deliberately naïve, child-like aesthetic which pulls back the horror and ushers forth some humour. Most chilling of all is Jackson Sprague's grotesque pig head, the viewing of which coincides with an unseemly allegation against David Cameron; vernacular satire Hogarth himself would delight in. Despite the occasionally gruesome figures and contorted shapes and body parts, there is something oddly uplifting about 'Wasters'. This is found in the poetry of reformulation, where creation from waste aligns with a contemporary re-presentation of vernacular English satire. With such a range of enjoyably gaudy works, it poses the question whether the exhibition design, in its elegant economy of means, might too have spoken the vernacular language of the works it displays.